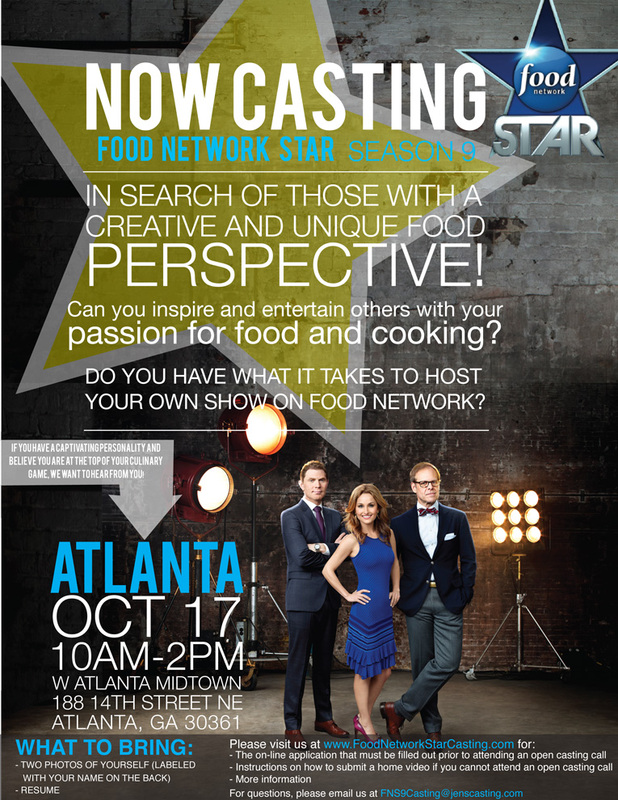 Are you the Next Food Network Star? Food Network is looking for talented chefs and culinary professionals with a captivating personality who believe they’re at the top of the culinary game and want to inspire a Food Network audience through their passion for food and cooking! On October 17 from 10am - 2pm Food Network will be performing a casting call at the W Atlanta Midtown (188 14th st, NE, Atlanta, Ga). There are two ways to apply. Please read over the rules and eligibility requirements before applying for Food Network Star. OPTION 1: Attend a Program open casting call and fill out the online application (open call dates and locations). OPTION 2: Submit a 3-minute home video and fill out the below online application (home video instructions). 4. One (1) legible photocopy of EITHER (1) your passport; OR (2) your driver’s license OR (3) your state ID card.